Big Red Wine and a “Blue Chip” appetizer. The Seghesio family roots are firmly planted in Zinfandel as our Great-Grandfather, Edoardo Seghesio, first planted Zinfandel on our Alexander Valley Home Ranch in 1895. Today, they share his passion as we farm over 400 acres of estate Zinfandel in the worlds best growing regions for the grape — Alexander and Dry Creek Valleys. This wine combines sites that have produced Zinfandel for over a century with newer sites that utilize proprietary clones and the most advanced viticultural practices. When Grandfather Edoardo first planted Zinfandel on our Home Ranch in Alexander Valley in 1895, Zinfandel was known as the “boss” grape in Sonoma County. It earned its popularity by thriving in the California sun and providing good color and sugar at harvest. To the many Italian immigrants in Sonoma County, Zinfandel was reminiscent of the fruit-driven wines of their homeland. Because wine was an everyday part of the family meal and, the fact that Zinfandel is drinkable within a year of harvest, it became preferable over varietals that need years of aging. The Sites: This wine comes primarily from four estate vineyards: Home Ranch, San Lorenzo and River Road in Alexander Valley, and Cortina in Dry Creek Valley. Several of these sites have produced Zinfandel for over a century, while the newer sites benefit from proprietary clones and the most advanced viticultural practices. Yields are kept at or below 4 tons per acre. The Wine: Every year, we bring in approximately 35 lots of Zinfandel averaging 25-30 years in age. Each of these lots is produced under the careful eye of our winemaker, Ted Seghesio. The best of these lots are selected to make Sonoma Zinfandel. A small amount of Petite Sirah is added to the wine for added complexity. The result is a tantalizing black raspberry and classic briary flavored wine with a balance of components for which the Seghesio wines are known. The Seghesio Story begins in 1886 when Edoardo Seghesio departed his family’s vineyards in Piedmonte, Italy for a new life in America. Like so many immigrants, he was drawn to Northern Sonoma County and the Italian Swiss Colony, to follow his passion for winemaking. The “colony,” as it was known, hired immigrants for three-year stints, providing room and board and then, a lump sum at the end of those three years enabling employees to buy land or set up a business in their new home. Soon, Edoardo rose through the ranks to winemaker. Yet, he yearned for home. The Colony’s manager repeatedly encouraged him to stay and finally, it was his niece and the opportunity to purchase land that convinced Edoardo to remain. That young girl, Angela Vasconi and Edoardo were married in 1893. In 1895, they purchased a modest home in northern Alexander Valley, less for the home than the surrounding 56 acres Edoardo recognized as ideal vineyard land. They planted the “Home Ranch” that year to what has become our family’s lifeline – Zinfandel. Edoardo remained at the Colony while building his own winery in the evenings after work. Upon its completion in 1902, the young couple began Seghesio Winery while raising their five children. In 1910, they acquired additional acreage surrounding the bustling train station in what was then “Chianti, California.” Edoardo, appropriately, planted the 10 acres to the Chianti field blend of Sangiovese, Canielao Nero, Trebbiano and Malvasia. That vineyard, they call Chianti Station is North America’s oldest planting of Sangiovese. In the years preceding Prohibition, the business flourished and the Seghesio Family gained a reputation for quality wine and their generosity toward others getting their start in this fledgling industry. Six months prior to Prohibition, and convinced it could not last more than a year, Edoardo made a decision to purchase his former employer, Italian Swiss Colony. The “Colony” with a 4,000,000 gallon capacity winery and its 1100 acres of vineyards were quite a value at $127, 500. As Prohibition prevailed, however, the debt was too much for Edoardo to bear. In 1920, he brought on partners, his brother-in-law, Enrico Prati, and the Rossi Family who were previous owners and at whose request Edoardo came to America. Edoardo sold his shares in 1933. 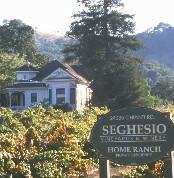 Upon repeal of Prohibition, the family once again opened the doors of the winery and Seghesio was making a come back. Unfortunately, Edoardo passed away in 1934 leaving the winery and all property to Angela. From then, Angela and her sons, Arthur, Frank and Eugene continued making wines and shipping via the railroad. With their hard-earned knowledge, they added vineyards when they could purchase them without debt. In 1949, they purchased a second winery facility in Healdsburg to enable them to keep up with the growing demand for their wines. In January 1958, the newspaper headlines read that Sonoma County’s wine industry had lost its matriarch when Angela passed away. Angela’s legacy as an industry leader and a great chef lives on in her grandchildren. Her sons formed a partnership based on the ideals of their parents, family, hard work and passion for the industry. From the time of Angela’s death until the mid 1970s, the Seghesio Family flourished in the bulk wine business, producing most of the red wine made in Sonoma County. At their largest, 1,700,000 gallons were produced between the original winery in Chianti and the Healdsburg winery. Yet, as the industry evolved, so did the Seghesio family when in 1983, the first wines were bottled under the Seghesio label at the hands of Ted Seghesio, a fourth generation family winemaker. Ted was not only the winemaker but sold and delivered wine too. In 1986, his cousin Peter Seghesio joined the business and began to set up a distribution network nationwide. By 1993, the Seghesio brand had grown to 130,000 cases of not only the family’s zinfandel and Italian varietals, but also Chardonnay, Cabernet, Sauvignon Blanc and both red and white table wine. It was in that year that the younger generation was given control of the winery. Fortunately, they too shared a passion for the land and a desire to produce wines they were passionate about. They turned their focus to the vineyards and eliminated all but the wines we grow reducing production to 30,000 cases. Today the family is proud to passionately produce almost exclusively estate wines, some from those same vineyards Edoardo and Angela first planted in the late 1800. This wine selection will pair wonderfully with this “Blue Chip” appetizer, especially if you are daring enough to try it with the bacon. Have fun with this pairing, I’m sure you will love it as much as my family and I have. From my table to yours.